WEST Yorkshire aces Slaithwaite & District AC were full of praise for <?xml:namespace prefix = st1 ns = "urn:schemas-microsoft-com:office:smarttags" />Warrington‘s Steve Conroy as they celebrated a magnificent victory in the Team event at the Embassy Division Four National Angling Championship on the Bridgewater Canal at Warrington on Saturday (June 21). A total of 23 teams took part and, with the National Federation of Anglers restructuring the National Championships to four Divisions next season, the top 20 teams were promoted to Division Three with the remaining three teams staying to fight it out again in Division Four. In a match which didn’t produce a single dry net, Slaithwaite & District, who are based in and around Huddersfield, collected £630 as they totalled 210 points – just three points clear of Sussex outfit Fox Match Arun. It is the second year in a row that Slaithwaite have been promoted. And Slaithwaite “coach” Steve Conroy, who fishes for Drennan North West and is the brother of England star Stu, was there to join in the celebrations as his expert knowledge of the Bridgewater Canal paid off in style. Slaithwaite skipper Dean Harris, a 41-year-old cloth finisher from Huddersfield, said: “The club has been going for around 100 years and this is the greatest result we have achieved as a team. We are a squad of canal anglers and we really thought we could do something at this match as it was almost a local water for us. We hoped it might be our year at long last and we put in six weeks of really hard practice. Using Van Den Eynde Super Cup and Super Match groundbait, Slaithwaite’s team plan was to fish at 13-14½ metres halfway up the far shelf with white maggot over squatt and also to fish punched bread and white maggot over bread. Slaithwaite’s top performer was Huddersfield‘s Stuart Whitwam who landed small bream and roach to win F Section and finish 10th overall with 2.790 kg. Three Slaithwaite anglers also finished third in their Sections – skipper Dean, in his third year in charge, weighed in 1.860 kg in J section, Mark Turner netted 1.450 kg in A Section and John Harman put 1.800 kg on the scales in C Section. Like many teams, Arun opted to go for small fish, aiming for up to 1 kg a man after eight of the team spent two days practising on the canal the previous weekend. Their best performer was Worthing‘s Darren Barton who won A Section and came 11th overall with 2.670 kg while they had two anglers in second place in their sections – Horsham’s Neil Boniface with 1.840 kg in C Section and Worthing‘s Steve Peacock with 2.260 kg in F Section. Steve was also 15th in the Individual. The bronze medals and £360 in the Team event went to Essex side, Fox Match Ockendon, with 196 points. 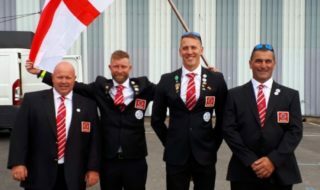 This was only the second time that Ockendon had entered a National and they certainly have an impressive record after coming home second in Division Five on the River Nene last year! Ockendon skipper Gerry Edwards, a 38-year-old pattern maker from Rainham, Essex, said: “To win silver and bronze medals in our first two years is a great performance by the whole squad – now we can’t wait to fish in Division Three ” They also opted for a squatt approach, looking for 1 kg a man. Ockendon’s top points scorer was Paul Stanley, a 35-year-old French polisher from Hackney, East London, who finished a superb sixth overall in the Individual event when he won B Section with 3.020 kg – a catch that included a carp of nearly 2 kg. “I was catching small roach, perch and gudgeon at 11 metres when, halfway through the match, I noticed a carp on the far bank between the brambles. I went for it and hooked it almost immediately – it went straight for a nearby tree but I managed to get it out and into the net,” said Paul who tempted the carp on double caster on a size 16 hook to 4 lb line at 16 metres. In the Individual event, Mike Sharpe (pictured above) caught more than 80 roach but it was two quality bream to almost 1 kg that swung the title his way from Peg H9 near Moore village. Fishing squatt over groundbait on a size 26 hook on the far shelf, Mike hooked the first good bream after 90 minutes and then netted the title-clinching bream with an hour to go. There might have been a fairytale golden double for 73-year-old Derek Powell – probably the oldest competitor in the match – but he had to settle for a bronze medal and £492 in the Individual event with 3.520 kg from Peg M20 near Walton Bridge. It’s the most money Derek has won in a match! Fishing a double pinkie on a size 22 hook, Derek did really well to play and net a fine carp of just over 3 kg and he also added some small bream. And there was a bonus for Derek as his Billericay & District AC squad clinched promotion in 13th place with 136 points. 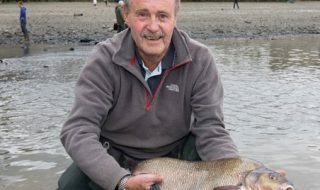 Billericay & District also supplied the fourth placed angler in Barry Lewis, a 61-year-old taxi driver from Danbury, Essex, who won K Section with 3.100 kg – a catch that included a carp of around 2.25 kg that he caught with three hours to go. 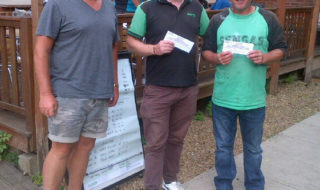 He said: “I started for small fish but hooked a carp which not only broke me but smashed the No.4 section of my pole. So, I changed up to double caster on 7 lb line and managed to hold the second carp. This is my best performance in a National.” Including money from a £5 each way bet, he went home with £500. 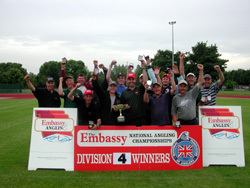 EMBASSY DIVISION FOUR NATIONAL ANGLING CHAMPIONSHIP TOP TEN TEAMs: 1. Slaithwaite & District AC 210 pts; 2. Fox Match Arun 207 pts; 3. Fox Match Ockendon 196 pts; 4. Cinque Ports AS 180 pts 5. Stoutshill AC 175 pts; 6. Barnsley Millennium AC 169 pts; 7. 26th Lancs Home Guard AS 169 pts ((Barnsley Millennium and 26th Lancs Home Guard finished level on points but Barnsley Millennium take sixth place on superior Team weight – 10.920 kg to 10.840 kg); 8. Thornhill CPM AA 154 pts; 9. Group 35 Shuttlers 146 pts; 10. Bolton & District AA 143 pts. INDIVIDUAL: 1. Mike Sharpe (Thornhill CPM AA) 4.000 kg; 2. Billy Usher (Cinque Ports AS) 3.870 kg; 3. Derek Powell (Billericay & District AC) 3.520 kg; 4. Barry Lewis (Billericay & District AC) 3.100 kg; 5. Dave Phillips (Emigration Match Group) 3.070 kg; 6. Paul Stanley (Fox Match Ockendon) 3.020 kg. PreviousWant to be a professional carp angler?